Alok Kejriwal – CEO and Co-Founder of Games2win said, “Dress Up Mobile Games are one of the most played games in the world, by girls across all age groups. Globally, Dress Up games enjoy over 300 million downloads a year. While developing these games, our Product Managers conduct deep research about fashion trends, concepts and what’s hot and what’s not. 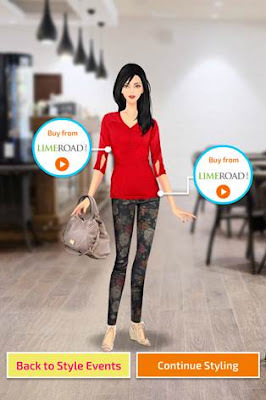 A few months ago, it occurred to us to approach some of the most popular online fashion brands in India and proposed featuring their best products in our games. Many progressive brands loved the inventiveness of our idea and signed up to be featured! We launched ‘Indian Fashion Stylist’ on the Android and iTunes stores featuring stylish garments from leading brands such as Limeroad.com. Within the game, when consumers play with branded products, we highlight the brand and link the product to the brand’s Mobile website where consumers can spend more time mobile shopping, exploring shopping options. We believe that this blend of deep engagement with fashion, brands and game play is a massive leap forward in mobile experiential marketing and delivers 100 times more engagement vs. static or video mobile ads. In ‘Game Commerce’, consumers play with the brand. They connect at a personal level vs. just watching an ad. This makes them remember the brand and even buy it”. Within a week of launch, the game has recorded 20,000 downloads and over 170,000 game plays. While playing the game, a stunning 40% of consumers have clicked on the live links to visit the mobile pages of the fashion brands and explore more options.